Iran: No Need For Talks With U.S.
Supreme leader Ayatollah Ali Khamenei said Iran does "not need" talks with the United States over its nuclear program because nothing would be gained, state television reported Tuesday. The United States has said that if Iran accepts a package of incentives meant to get Tehran to suspend uranium enrichment, it would join its European partners in negotiations with the Islamic republic over a framework for its nuclear program. That package was offered earlier this month. "Negotiations with the United States would have no benefit for us, and we do not need them," state television quoted Khamenei as telling Senegalese President Abdoulaye Wade. Washington's offer to join talks was seen as a major concession since the United States lists Iran as a sponsor of international terrorism and there have been no diplomatic relations between the two countries since 1979, when militants stormed the U.S. Embassy in Tehran and took Americans hostage for 444 days. The White House said it does not recognize Iran's latest statement as "an official response," CBS News correspondent Peter Maer reports. Spokesman Tony Snow said the U.S. expects Iran to communicate directly with the U.N. on the issue. The package of incentives seeks to persuade Iran to place a long-term moratorium on the enrichment of uranium, a process that can produce fuel for nuclear generators or the material for nuclear warheads. Iran has long refused to back down on its enrichment program, saying it has a right to the peaceful exploitation of nuclear energy. 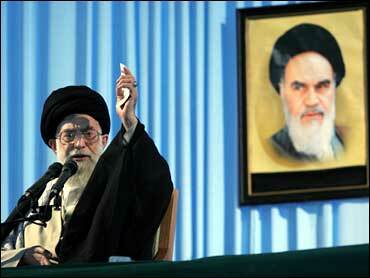 "We do not negotiate with anybody on achieving and exploiting nuclear technology," the TV quoted Khamenei as saying. "But if they recognize our nuclear rights, we are ready to negotiate about controls, supervisions and international guarantees." Khamenei, who has final say on all state matters, said the West would misuse the negotiating process to pressure his country.